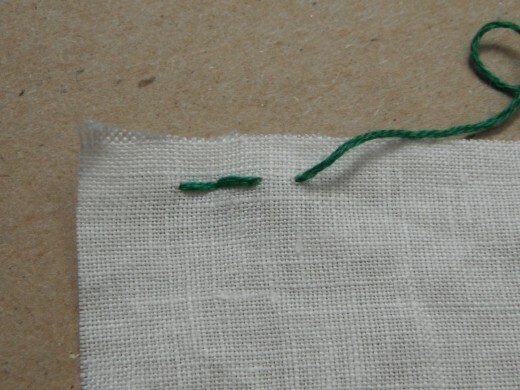 The backstitch is a secure hand sewing stitch that is ideal for seams under pressure. A decorative variant of the backstitch, known as the split stitch, is one of the world's oldest embroidery stitches. 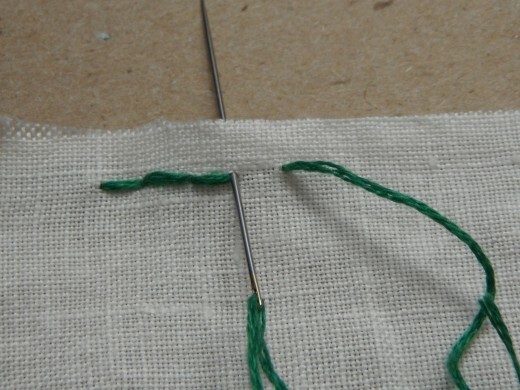 This tutorial shows you how to form a basic back stitch, as well as two embroidery variants: the split stitch and the stem stitch. Describing stitches in words is difficult, so if you ever find the text confusing, please look at the pictures to the right. 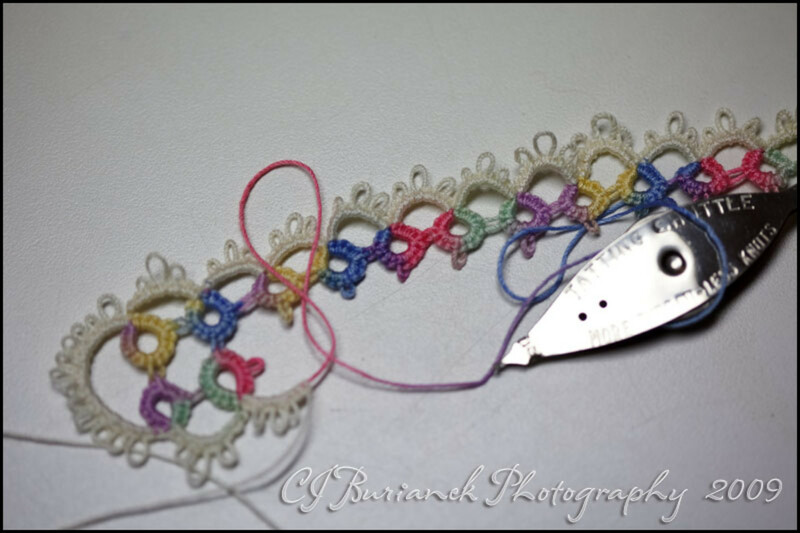 I have photographed virtually every step in the process of sewing all three stitches. 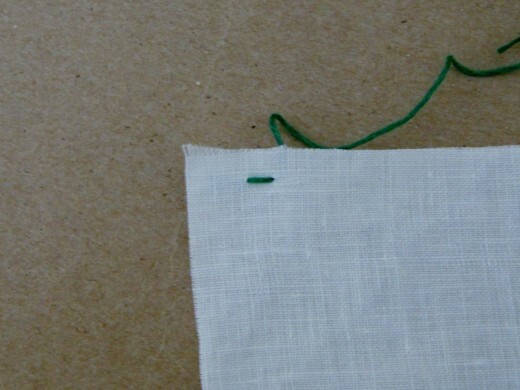 The backstitch is easy to sew. 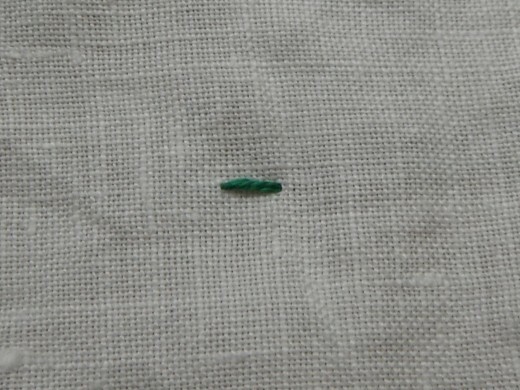 Because I wanted the stitches to be visible, I made large stitches with green thread. Unless you are doing decorative embroidery, I highly recommend choosing a thread that matches your fabric. Also, you probably will want to make smaller stitches than mine. First, secure your thread. You may either tie a knot at one end or make a couple of anchoring stitches. 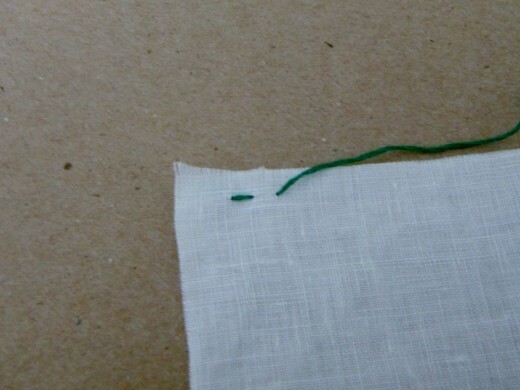 Then, thread the needle and pull the needle through the fabric from back to front. Pull the thread until the knot catches. 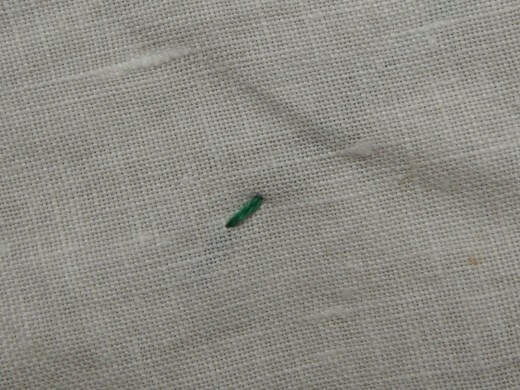 Next, reinsert the needle to the right of your original hole, this time piercing the fabric from front to back. Move the needle the same distance to the right, again, and pull the needle from back to front. All three points should be in a straight line. 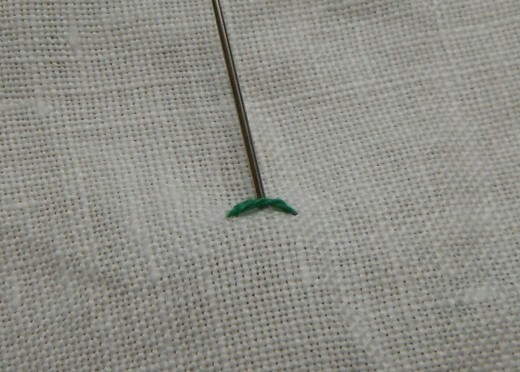 To begin the 'back' part of the process, reinsert the needle into the leading edge hole of the previous stitch, as shown. 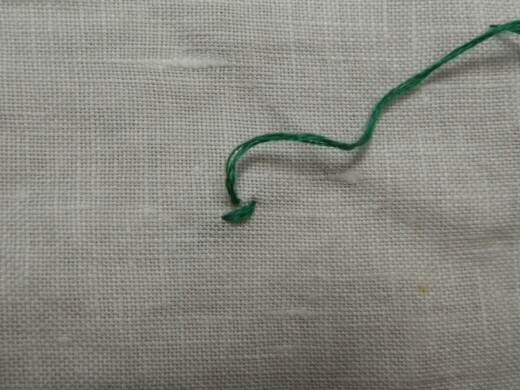 Pull the slack thread through to tighten the stitch. 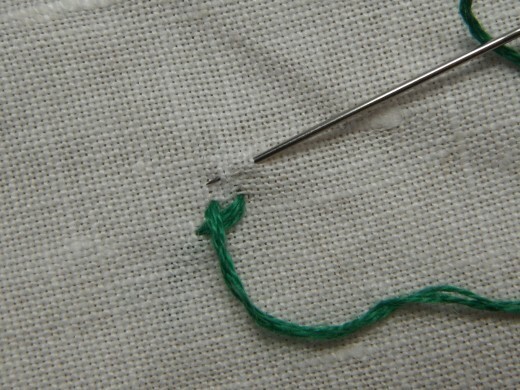 You should now have two small stitches touching each other to form a straight line. Continue sewing by moving one stitch length to the right and doubling back so the left side of each stitch shares the same hole as the right side of the previous stitch. This continual two steps forward, one step back approach is why the backstitch is called the backstitch! 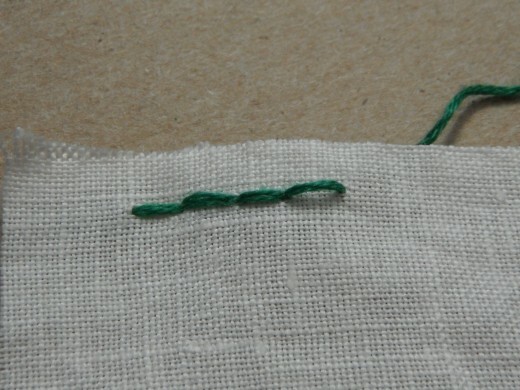 Sew in this manner for as long as necessary, and then secure your thread to finish the seam. 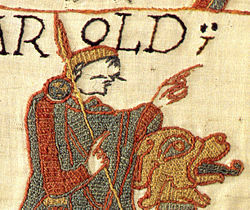 The split stitch is a very old embroidery stitch seen on many Medieval tapestries, most notably the Bayeux Tapestry. 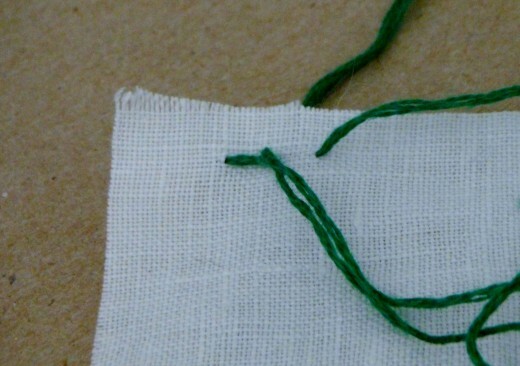 Once you are familiar with the basic backstitch, it is very easy to sew. 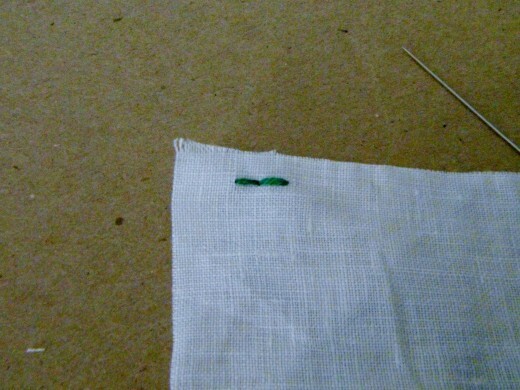 Just as with the basic backstitch, begin by making one small, straight stitch. 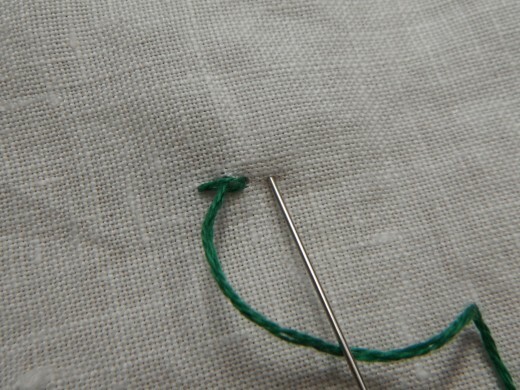 Then, bring the needle and thread from back to front, piercing the fabric one stitch's length to the right of the original stitch. Then, try to literally split the first stitch in half with the needle and pull the thread from front to back so it bisects the first stitch. 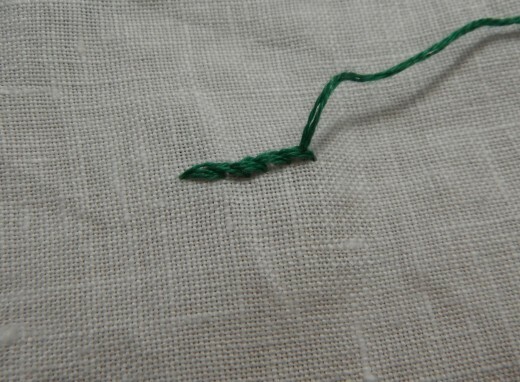 Continue on by moving one stitch length to the right and then halving the previous stitch. This creates a chain-like appearance that works well as an outlining embroidery stitch, as well as a fill stitch. The stem stitch is the most difficult of these three stitches, but only because it requires the most precision in order to look beautiful. 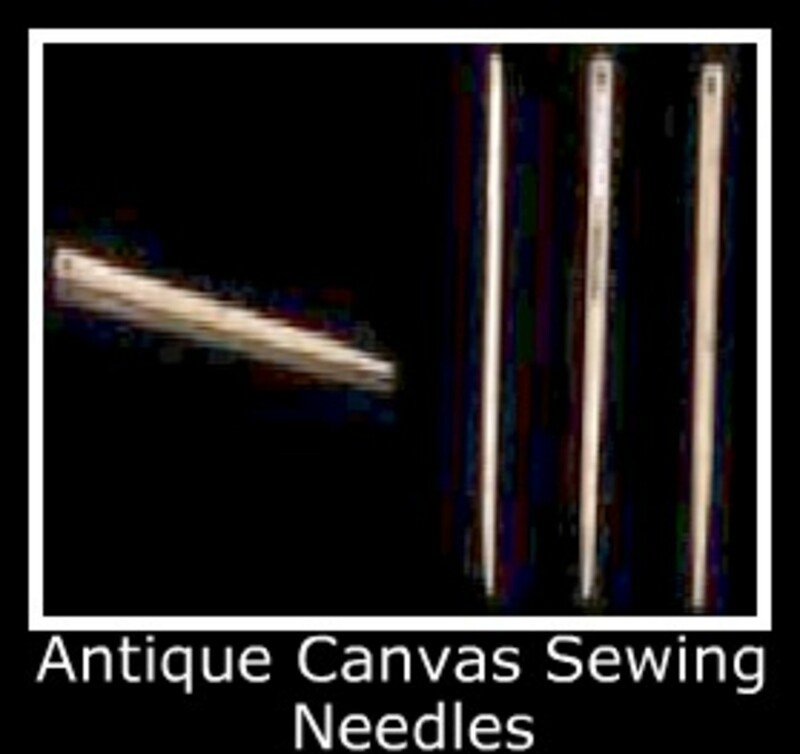 The stem stitch is a popular outlining stitch in embroidery, particularly for elements like flower stems. 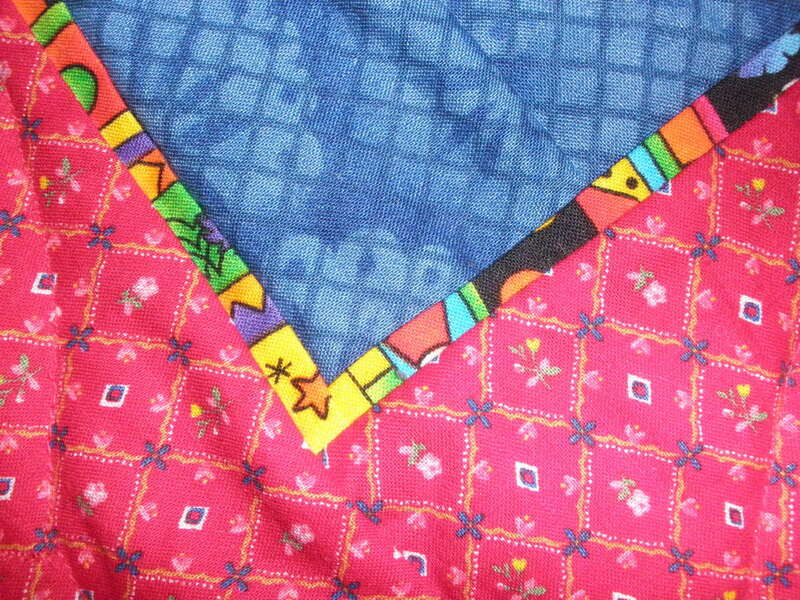 It is usually made along a pattern's line with each stitch straddling the line. It has a beautiful, spiraling appearance and is definitely worth the small amount of practice it takes to master. To practice without a pattern, make a small stitch that is slanted up and to the right, like a forward slash on a keyboard. Then, continuing at the same angle, bring the needle from back to front about half a stitch's width to the right and slightly up. Complete this stitch by inserting the needle from front to back halfway down the first stitch and just above it. The completed stitches should touch. Continue this process, moving up and to the right. Click on the pictures at the right to enlarge them and examine this process. The most difficult part of this stitch is keeping the angle and stitch length the same. The backstitch is a secure and versatile stitch. I hope these instructions help you learn how to form the basic backstitch, as well as the split stitch and stem stitch, so you can create new garments, make quick repairs, or even create beautiful embroidery. My mother made many (very cute) smocked dresses for my sister and me, so I know what you mean. I also grew up with lots of homemade clothing from my mother and grandmother. I also always had the coolest costumes! 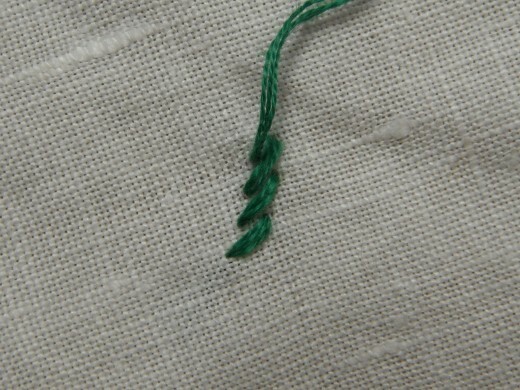 The stem stitch is pretty. My mother as a natural seamstress and made most of our clothing growing up. I can remember the detailed work she put into many of our dresses. It is time consuming but the results are beautiful. I can see that you have great skill in this as well. Thanks for the lesson in stitching. Thank you very much stessily! Too often, I find online sewing guides are difficult to follow, so I try to make clear guides. I'm really glad they make sense to someone else! Natashalh, Your instructions and accompanying photos explain these stitches well. Even though I've been sewing since I was knee-high to a grasshopper and even though I know these stitches so well that I could do them in my sleep, I still enjoyed reading your words and looking at your photos. 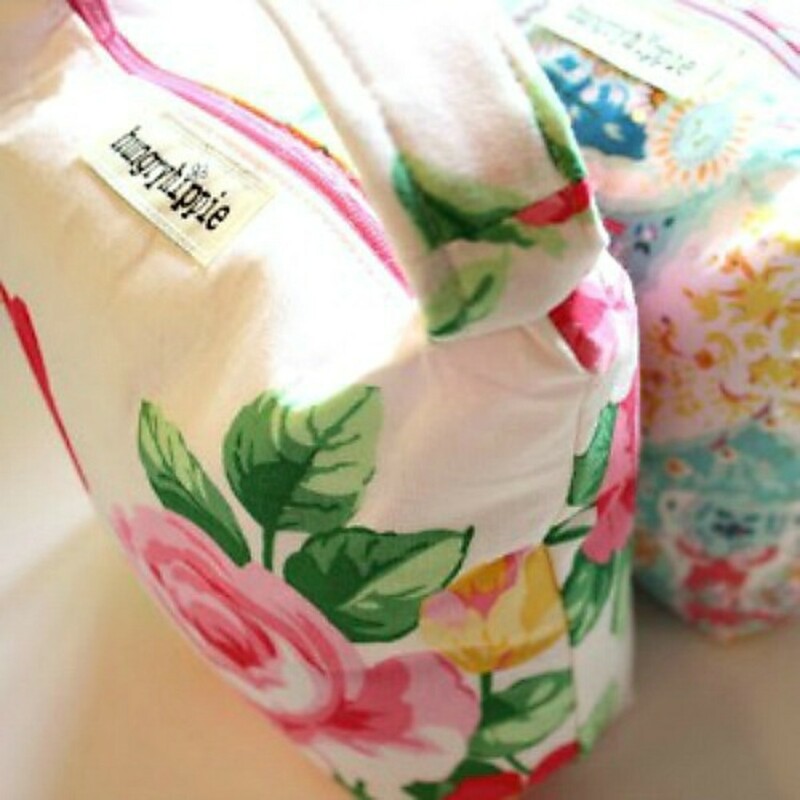 For those who sew, it's a nice journey through the artistry of sewing. For those who don't sew, it's a nice tutorial. Win-win. Thanks for another great resource. Up and useful! There is an unimaginable variety of stitches. 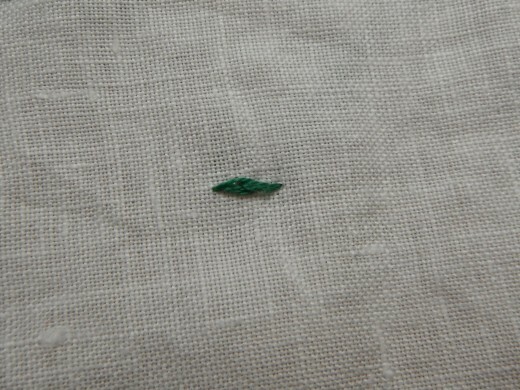 Even though I love sewing, I frequently come across stitches I haven't seen (or at least haven't seen named) before. Thanks for stopping by and taking the time to comment! I always love it when a new hub gets its first comment. Nice informative hub! I'm embarrassed to say that I didn't even know there were different hand sewing stitches before this.